A team of researchers from the U.S., Japan and Switzerland has found possible evidence of a source of energy that could be responsible for heating the sun’s corona. In their paper published in the journal Nature Astronomy, the researchers describe studying data from the FOXSI-2 sounding rocket and what it revealed. One of the interesting problems in space research is explaining why the sun’s atmosphere (its corona) is so much hotter than its surface. The chief problem standing in the way of an answer is the lack of suitable instruments for measuring what occurs on the sun’s surface and its atmosphere. In this new effort, the researchers used data from the FOXSI-2 sounding rocket (a rocket payload carrying seven telescopes designed to study the sun) to test a theory that suggests heat is injected into the atmosphere by multiple tiny explosions (very small solar flares) on the surface of the sun. Such flares are too small to see with most observational equipment, so the idea has remained just a theory. But now, the new data offers some evidence suggesting the theory is correct. To test the theory, the researchers looked at X-ray emissions from the corona and found some that were very energetic. This is significant, because solar flares emit X-rays. But the team was studying a part of the sun that had no visible solar flares occurring at the time. This, of course, hinted at another source. The research team suggests the only likely source is superheated plasma that could only have occurred due to nanoflares. The researchers acknowledge that their findings do not yet solve the coronal heating problem, but they believe they might be getting close. They note that much more research is required—next year, they point out, another sounding rocket will be launched with equipment even more sensitive than that used in the last round, offering better detection of faint X-rays. Also, plans are underway to launch a satellite capable of detecting nanoflares. If future tests can clearly identify the source of the X-rays, the coronal problem may soon be resolved. The processes that heat the solar and stellar coronae to several million kelvins, compared with the much cooler photosphere (5,800 K for the Sun), are still not well known1. One proposed mechanism is heating via a large number of small, unresolved, impulsive heating events called nanoflares2. Each event would heat and cool quickly, and the average effect would be a broad range of temperatures including a small amount of extremely hot plasma. However, detecting these faint, hot traces in the presence of brighter, cooler emission is observationally challenging. Here we present hard X-ray data from the second flight of the Focusing Optics X-ray Solar Imager (FOXSI-2), which detected emission above 7 keV from an active region of the Sun with no obvious individual X-ray flare emission. 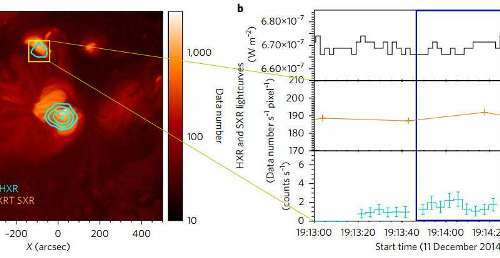 Through differential emission measure computations, we ascribe this emission to plasma heated above 10 MK, providing evidence for the existence of solar nanoflares. The quantitative evaluation of the hot plasma strongly constrains the coronal heating models.